On the eve of their debut exhibition opening, we talk to artist Kingsley Ifill and curator Tom Beard to find out the concepts and inspirations behind their new exhibition. 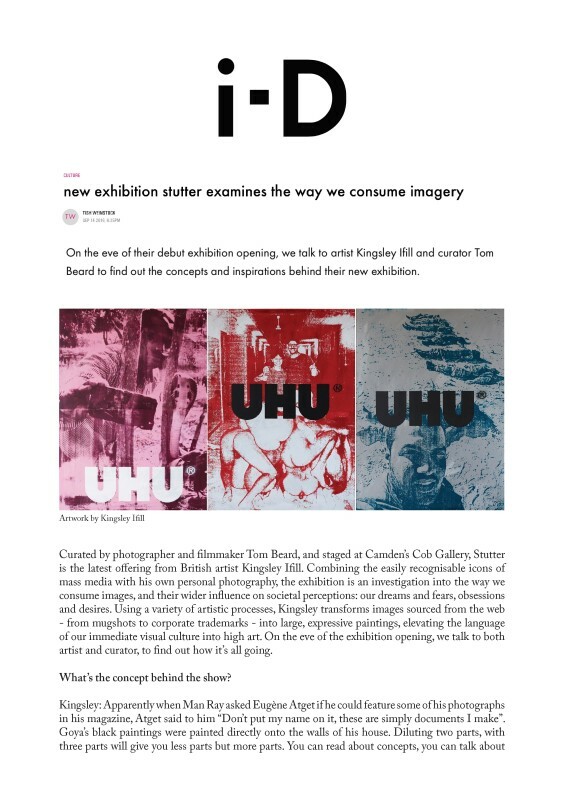 Curated by photographer and filmmaker Tom Beard, and staged at Camden's Cob Gallery, Stutter is the latest offering from British artist Kingsley Ifill. Combining the easily recognisable icons of mass media with his own personal photography, the exhibition is an investigation into the way we consume images, and their wider influence on societal perceptions: our dreams and fears, obsessions and desires. Using a variety of artistic processes, Kingsley transforms images sourced from the web - from mugshots to corporate trademarks - into large, expressive paintings, elevating the language of our immediate visual culture into high art. On the eve of the exhibition opening, we talk to both artist and curator, to find out how it's all going.